Pine Street Carpentershas been awarded a 2015 Guildmaster Award for exceptional customer service. Thedistinction recognizes Pine Street among North America’s best customer serviceleaders in the construction industry. 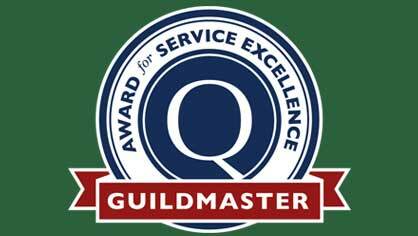 GuildQuality, an independent customer satisfaction surveyingcompany, has powered the Guildmaster Award since 2005 to celebrate serviceexcellence in the building, remodeling, contracting, and home servicesprofessions. Pine Street Carpenters wasselected by GuildQuality for the remodeling firm’s superior delivery ofcustomer care. Over the past few months, GuildQuality reviewed numerous surveyresponses submitted by customers of Guildmaster candidates. In granting awards,GuildQuality considers two primary metrics for each candidate: the percentageof customers who would recommend and the percentage of customers who responded. In the home building,remodeling, and real estate industry, the average customer recommendation ratefor businesses is approximately 70%. Pine Street’s GuildQuality recommendationrate stands at 99%. We thank all our clients for placing their trust in us and for continuing to recommend us to their friends, family and neighbors. We invite you to view our profile – and client feedback – on GuildQuality.